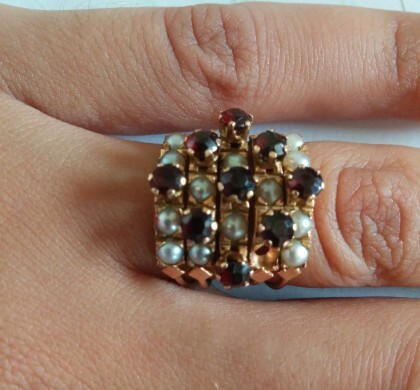 Spend some time on the Etsy site and you’ll quickly find its a treasure trove of vintage and antique jewelry. Thanks to Instagram I’m always discovering new Etsy Jewelry sellers to fall in love with. I’m going to share just a few of my favorites below. 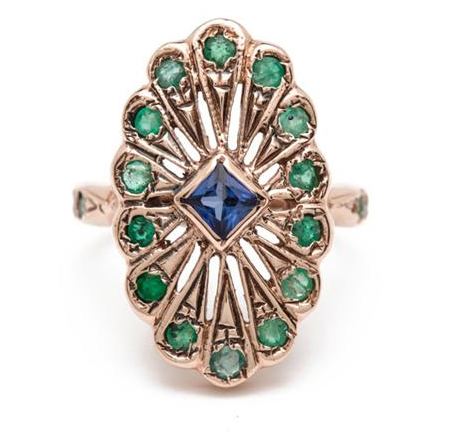 From top; White gold Bar brooch, Rose cut sapphire and diamond ring, and old cut diamond and Tsavorite ring. All available from Gilded Lane. Run by Athena Worth this etsy shop is a treasure trove of seriously beautiful vintage items. A self proclaimed jewelry fanatic she has a great eye for really amazing stuff. 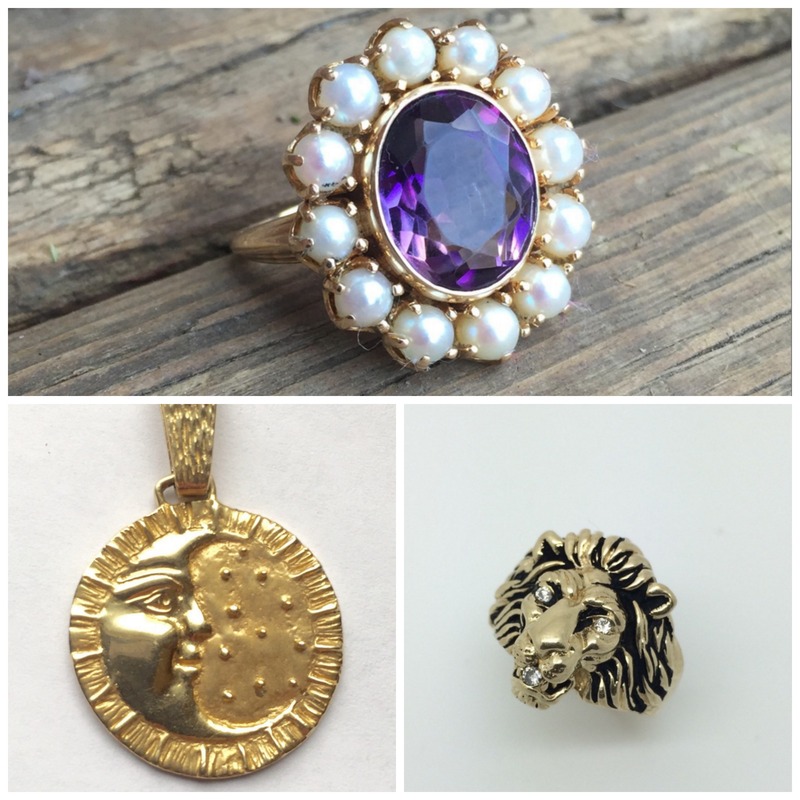 Clockwise from Top; 14k Amethyst and seed pearl ring, 10K Lion ring, and 14k Man in the moon and starts pendant. 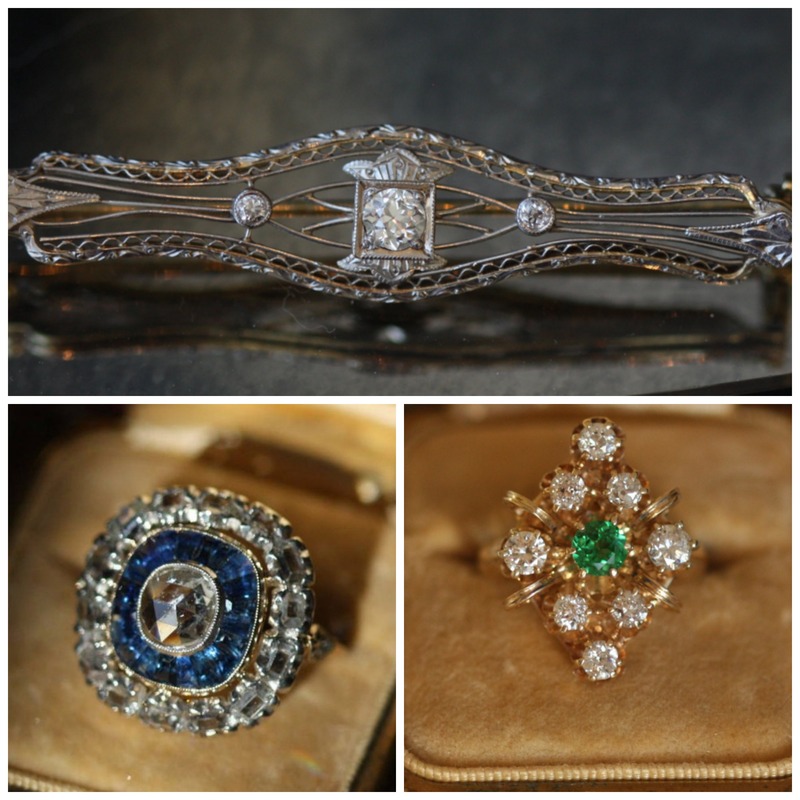 Kim Higley the proprietress behind Estate Jewelry Mama, is a GIA educated Graduate Gemologist and bench jeweler. 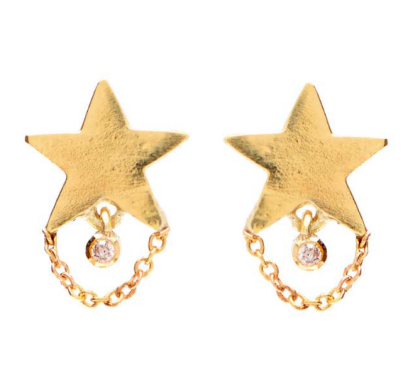 She restores and converts all sorts of antique jewels into wearable goodness. 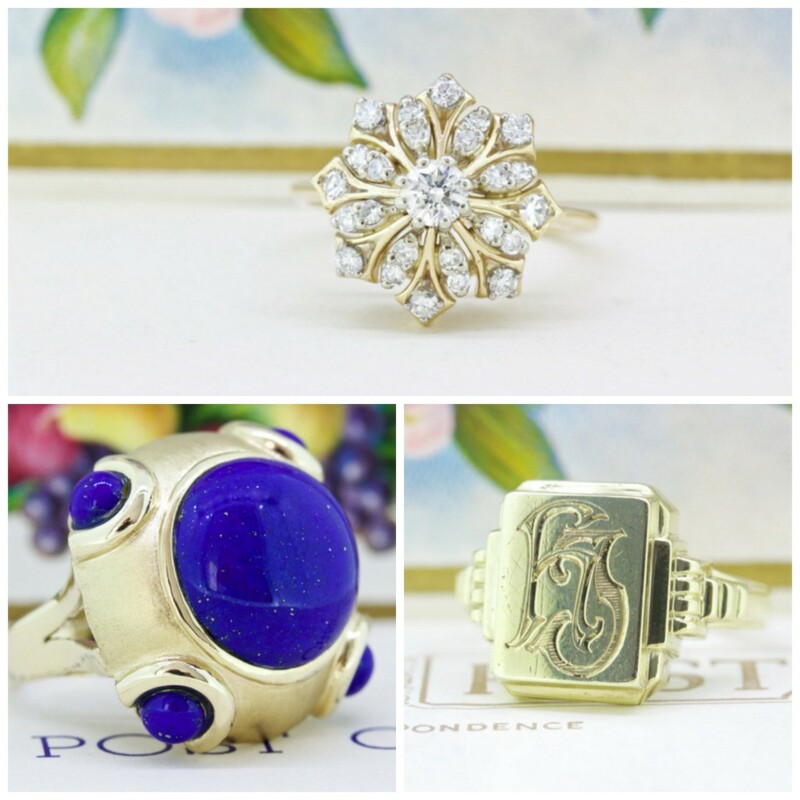 Clockwise from top Diamond and gold engagement/cocktail ring, gold signet ring, gold and lapis lazuli ring, all available from Fergusons Fine Jewelry Etsy Shop. Husband and wife team Thomas and Jo Ferguson, collect and curate fine and antique jewelry which is sold on their Etsy site. 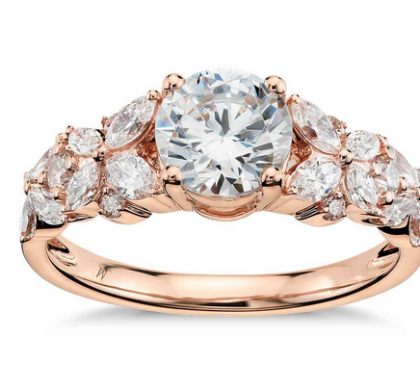 They have a really fantastic selection of vintage and non traditional engagement rings and wedding bands. 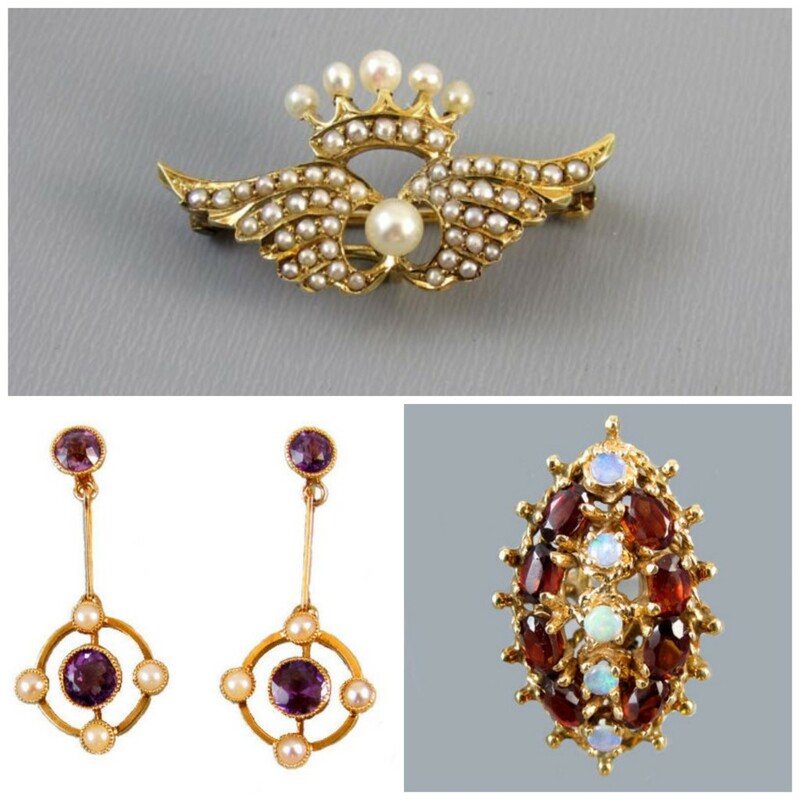 Clockwise from top; Seed Pearl Brooch and Pendant watch pin, Garnet and opal Cocktail ring, Amethyst and pearl earrings, all available from Sunday and Sunday. Another couple team, Ed and Carolyn Sunday have a fantastic collection of cameos, watches, and whimsical antique and estate pieces. They are GIA educated and have an eye for really great pieces.